Instead of working behind the camera like I usually am, earlier this week I was in front of my favourite photographer’s lens working in a beautiful kitchen with a handful of recipes from my book. We were shooting some kitchen scene and outdoor photos to sprinkle in my cookbook. Our landlord was gracious enough to lend us her beautiful kitchen for the day so I was surrounded by gorgeous white cabinets, stainless steel, and a walk-in pantry. I had to pick my jaw off the floor when I walked in. What a dream! Our wedding photographer, Dave Biesse, happened to be visiting family in Ontario this month and by a stroke of luck he was available to do the shoot at the last minute. Reuniting with him just shy of 5 years since our wedding and engagement shoot was a real treat. Dave is so warm, creative, and fun to work with. Not to mention, that Australian accent can make anyone feel at ease! Dave and Charlotte now live in Australia year-round so we don’t get to catch up nearly enough, but they will always be dear to us. It’s been pretty chaotic around here, but exciting too. We stayed up into the wee hours of the morning for a couple nights preparing recipes, making lists, packing props, and making last minute grocery stores trips. Some recipes had to be made the morning of the shoot, so I was up super early prepping recipes and praying to the culinary gods that the food would stay fresh! Two packed coolers, 4 containers with props/appliances, a handful of freshly ironed clothing, one packed car, and a few butterflies for good measure. A couple friends suggested that I hire someone to do my hair and make-up so I wouldn’t have to worry about it during the shoot. It sounded like a good plan, but after getting a trial done last week I ended up looking like I was going to meet the Queen. hah. I didn’t even recognize myself in the mirror. Not ideal. I don’t normally do dark eyes or maroon lipstick and I rarely curl my entire head of hair. Eric looked at me with a bit of horror on his face when he saw the finished look. It was priceless. In the end, I opted to do my own usual hair and make-up and I felt much more comfortable. Maybe it wasn’t super glam, but I felt like myself (on a good day, I suppose) which is all that matters. I planned on taking lots of behind the scenes shots to show you, but unfortunately I didn’t have many spare moments during the day so I only snapped a couple. Here is a picture of our landlord’s kitchen. Hello, dream boat! This is a tiny glimpse of the chaos that took over shortly after we arrived in the AM. The entire family room was packed with our stuff. 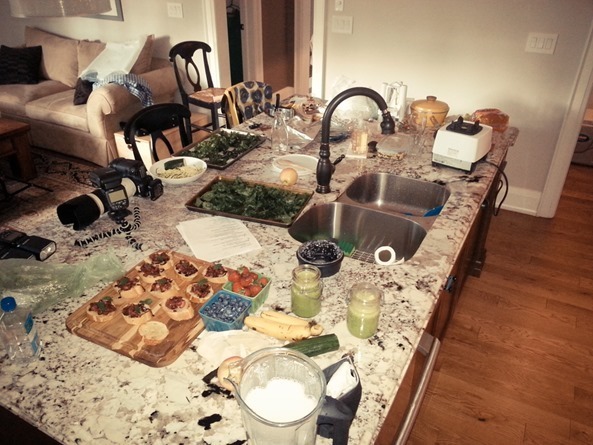 Each time we did a new shot/angle, we had to move everything around the kitchen and then set up the new recipe. The hardest part was not being able to eat all the food though! When all was said and done, it felt like the day after a wedding. All this build up and then in the blink of an eye, it was over. Still, it’s nice to get back to everyday life where I’m free to get chocolate stains on my clothing and kale in my teeth. My Aunt Elizabeth made this raw chocolate fudge for our big family get together last week and it was a huge hit. Us ladies were all begging for the recipe which she adapted from the Company’s Coming Superfoods cookbook. This version below is an adaptation of both the original and Elizabeth’s version, swapping ingredients as I saw fit and cutting down the portion in half since it made so much. Even though this doesn’t have the texture of traditional fudge (it’s more like raw chocolate and smooth as silk), no one seemed to complain! It softens at room temperature (and melts in your mouth), so serve it straight from the freezer and chill leftovers as soon as possible. If you are a raw food purist and want a completely raw fudge use raw cacao powder and agave in place of the cocoa powder and maple syrup. Either way, it’s downright seductive. My Aunt Elizabeth made this raw chocolate fudge for our big family get together last week and it disappeared incredibly fast. Us ladies were all begging for the recipe which she adapted from the Company’s Coming Superfoods cookbook. This version below is an adaptation of both the original and Elizabeth’s version, swapping ingredients as I saw fit and cutting down the portion in half since it made so much. Even though this doesn’t have the texture of traditional fudge (it’s more like raw chocolate), no one seemed to complain. It softens at room temperature (and melts in your mouth! 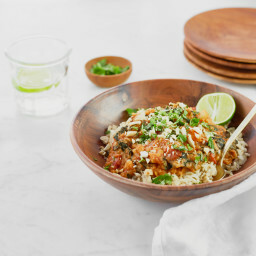 ), so serve it straight from the freezer and chill leftovers as soon as possible. If you are a raw food purist and want a completely raw fudge use raw cacao powder and agave in place of the cocoa powder and maple syrup. Either way, it’s downright seductive. With electric beaters, beat together the coconut oil and almond butter. Sift in the cocoa powder and beat again until combined. Pour in the maple syrup, vanilla, and salt and beat until smooth. Line a loaf pan with a piece of parchment paper. Scoop the chocolate mixture into the pan and spread out until even. I took another handful of walnuts, broke them up, and sprinkled over the top of the fudge for extra crunch and good looks. Freeze for about 1 hour, or until solid. Slice into small squares and prepare to be seduced. Note: I added a tablespoon of raw cacao nibs into my batch, but next time I will leave them out as I thought they were too crunchy in this fudge. On my to-make list! I’ve never made fudge before but, dangit, there’s a first time for everything! Oh my goodness this is so perfect! I was looking for some recipes to share with a dessert loving client, came across this recipe and had to make it immediately. After all, I can’t share a recipe I haven’t tested myself, right? ;-) Now added to my go to list for chocolate loving clients. I always recommend your site but missed these until now! Thank you! Angela that looks so good! I’ve actually seen baked brownie recipes that use AB with a little coconut oil, cocoa, etc. I love that you kept this raw! I used to post raw vegan chocolate fudge years ago…like 2009. Whoa time flies :) Cocoa, agave, coconut oil – that’s it! I love that you worked in AB to this! Angela, this is freaking delicious! I just sat down to relax for the evening and had to get up immediately and make this (in about 7 mins flat, so fast and easy!) in my pjs and apron. Ha! Thanks for sharing. I licked the batter clean, but now it’s taking its sweet time in the freezer. If I write a blog post, credit you but also put the recipe on my site – is that okay? that was fast! so glad you enjoyed it so far. If you haven’t made any changes to the recipe, I prefer that you simply link back, but if you’ve modified it then go ahead and post your own version. Yeah I made them as soon as I saw the post. Guess I was in the mood haha. They only were in the freezer for 20mins and I tried one and it was BEST kind. 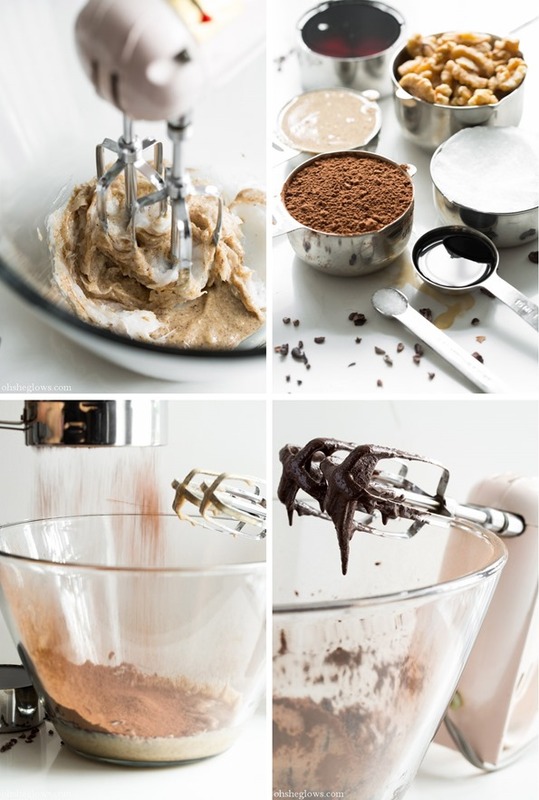 mine is in the freezer now, doesn’t matter how it turns out (too mushy or dry) I know it will taste great cause I already licked the batter off of the mixing spoons!! This fudge looks incredible! The lighting is absolutely gorgeous in all of the photographs, too. Congrats on the photo shoot for the book, I’m eagerly anticipating its release! Hey Andrea, Any liquid sweetener should work, although brown rice syrup will change the flavour a lot (I don’t think it would come out as sweet?). I would probably be inclined to try a smaller batch (maybe even a single serving) to see if you like the outcome. Then you don’t have to waste a whole batch if you don’t like it! I just made these using 1/4 cup brown rice syrup and 1/4 cup coconut nectar syrup and they turned out wonderfully! By the way, I am a huge fan of your blog, Angela. Every recipe I’ve tried of yours has been a hit at my house! Thank you! Thanks Sharon, so glad it turned out with your changes – enjoy the rest! First you get us the other day with those nut and seed bites and now this! I can’t even handle how good this looks. Pinned and will definitely be making some of this for the holidays. Now my question: what is almond butter? I`m from Germany and sometimes it`s a bit difficult to translate special foods. Is it really a kind of butter or more like pureed (spelling correct?!) almonds? What could I substitute it with? Or could I make it from scratch? I overlooked the link (I was so excited about the recipe), thank you for answering so quickly. Hi Antje, almond butter is “Mandelmus” in Germany (in case you didn’t find out already :-)! You can buy it in health food stores if you don’t want to make your own. Oh yum, this looks awesome! I’m not super into raw foods, but this just looks tasty. Your landlords kitchen really is beautiful! It seems like so much work to create a cookbook but I’m sure the end product will be well worth it. I’m also glad to hear you went for the natural look, I think that probably suits you more. What a perfect recipe! I love how easy it is to make. And the pictures are incredible too! Did you have help with the action shots or did you use a remote? It should be really thin when it’s first made, the coconut oil should freeze solid though. I seriously have almost everything on hand for this delicious looking fudge which clearly means I must make this ASAP. Love that kitchen and a behind the scenes peek. What a GORGEOUS setup! I bet that was a blast. I’m looking at starting to do more raw recipes on my website so this sounds like the perfect start. Thanks Angela! Quick question: that white background you use in your photos recently, what is it? I’ve been looking for something similar (i.e. white, smooth, slightly reflective, kind of like a mirror) for my own pictures but can’t figure out what kind of material I should buy, or how large the background should be. It’s a ratty old white cardboard actually! I think you can even see stains on it in the photos if you look closely. hah. I think I picked it up from Michaels? it’s been a while so I don’t exactly remember. I also use a larger white presentation board from Michaels too (it has the benefit of standing up on its own). The surface is a white marble slab. hope this helps! This fudge looks unreal. I’m trying to kick my sweet tooth because it’s been a tad out of control with all of the summer parties and fro-yo trips, and you are killing me with this recipe! In a good way of course. I’m so happy all your recipes are health conscious so at least I won’t be straying to far from my goals if I keep whip this up one evening. And you were right, your landlord’s kitchen is UNREAL. I had total kitchen envy. Glad you were able to enjoy yourself in that amazing space! 1) I want that kitchen! 2) I can’t wait for your cookbook! i want that…right now! def on my to do list! Oh my goodness Ange, that second-last photo of the fudge looks amazing!! And wow – that kitchen is something of my dreams! Thanks for giving us a little behind the scenes glimpse. I agree with you on the hair thing – whenever I decide to get it put up by someone else, I pretty much always wish I’d not bothered and just done it myself! I think the way you do yours is gorgeous and so natural, so I can’t wait to see the shots for the book! I will be making these this week for sure. I’ll have to give away most of the batch because there is no way I’ll be able to just eat a reasonable portion! ahhh crazy! It’s amazing how much work it is. Do you think this would work with walnut butter or is it too gooey? Love the recipe! It might work, however they might turn out a bit more “greasy” since walnut butter tends to be so slick. This is definitely dreamy. Yum! A photoshoot- how swanky! 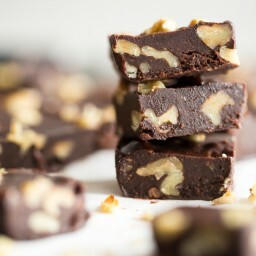 Can’t wait for the cookbook, and to make this fudge! Mmmm…I love fudge! I’ve never made my own before, but it sounds super easy! I really need to try it! Making this, delicious! That kitchen is breathtaking. This is just wrong. Why do you make me drool so early on a Thursday morning? ;) I’m fresh out of coconut oil or this would be happening right now. Mmm! Going to sub in toasted pecans since I’m allergic to walnuts. These last two recipes came at exactly the right moment! I think chocolate is the answer/cure-all for everything!! Can’t wait to make them! OMG – I want this like right now!! Looks amazing!! I’ve been kinda obsessed with almond butter fudge lately! What a kitchen! These photos are beautiful. Can’t wait for your cookbook! I took longer making breakfast this morning for my kids so I could make this. We just had some and it is divine. One child wanted more and I said later after we have done some jobs. He immediately went off and found some jobs to do! I love your recipes, thank you so much for them. I live in Spain and I do buy coconut oil for my skin but it is really expensive, only available from a health food shop, and I can’t imagine using it in any great quantity in cooking. It costs me more than 17 euros for 500ml. This is a tough call but can you think of any substitute that I could use that does not mean I have to mortgage the house? Hey Chris, That’s a tough one – the coconut oil is used in this recipe because it solidifies the fudge as it hardens when chilled. I don’t know of another substitute, but if I think of anything I will let you know! Awesome! I’m so glad to hear the substitution worked out well, Bethany! are there no Asian food stores in Spain? That`s where I buy my coconut oil (I live in Germany), and it`s like 3 or 4 euros for 500 ml. We order ours via Amazon b/c we live in a rural area in the US. Just a thought. That kitchen looks almost as yummy as the brownies. Great photos, thanks for this recipe. When you mentioned the hair/makeup I had to laugh. I did the same thing the morning of my wedding. After the professional left, I went into the ladies room and my best friend and I “made under” my heavily made up and styled self. Just feels so strange. You’re gorgeous and you don’t need help chica!! Def looking forward to the book! I just made these and am waiting for them to firm up to try my first one. I subbed sunflower seed butter just because I am fresh out of my homemade almond butter. I may have to hide some from the kids and my husband! Luckily, they whipped up so fast, I can make more easily. 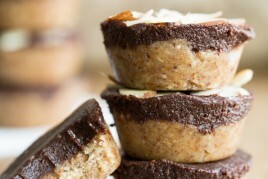 I have already made 2 or three batches of the almond butter cups – they went fast! Also, I put some of this in little heart-shaped silicone molds, and the rest in a loaf pan. I just made these…they’re awesome and super addictive! These pictures are amazing!! Love the clean lines and white backdrop! Wow! My boyfriend has been searching for a healthier treat. This is it! Just made these – easy and gorgeously smooth and yummy! I cut down on the amount of sweetener – I used agave and maple syrup mixed and used just over 1/2 the amount and it was fine. 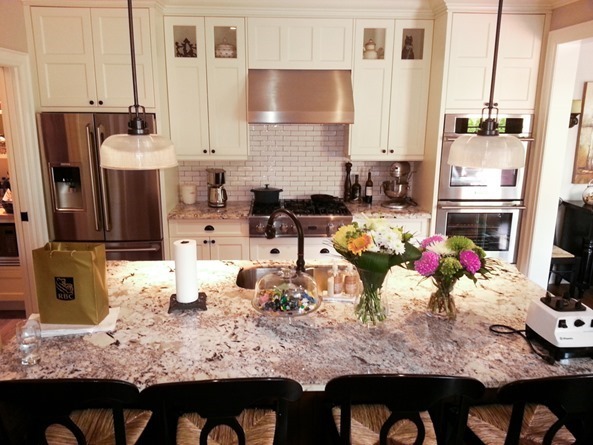 Beautiful kitchen and beautiful fudge! I can’t wait to see the final pictures in the cookbook; I’m sure they’ll be gorgeous! This looks unbelievable and I love how easy the recipe and ingredients are. I know for a fact that you look like a goddess as soon as you wake up of a morning, so I’m not surprised that you-as-you was far more stunning than you-packed-with-makeup could ever be. Can’t wait to see the photos! This could not have at a more perfect time. I was slammed with a major chocolate attack this afternoon! Seems giving up caffeine has made me want to SNACK! I am so excited for your cookbook! Thank you for sharing a few behind the scenes pics! Ahhh so cool all this is really happening. I hope you are having a blast and I can’t wait until your cookbook comes out!! I have some coconut oil in my kitchen and will try this out today! to soak it in every so often. Aww Carri! That totally made my day – seriously, thank YOU for reading for so long. That really amazes me! Made this us last night and it was amazing and super fast to make!! Can’t wait to try these! You had me at Seductive! DREAM DREAM DREAM Kitchen! Wow. First off, THIS. LOOKS. INCREDIBLE! And I pretty much have everything in my kitchen to make it. I just don’t have an electric mixer.. Do you think if I just whisk it super duper fast it will turn out? Haha. Also, your recipes have inspired me and make it easier for me to transition to the Vegan lifestyle. 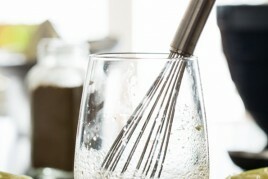 Yea I think whisking it fast could work just fine! :) Let me know how it goes. Thanks for your kind words by the way! What a gorgeous kitchen. I’m with you I prefer to do my own makeup and hair but feel comfortable. Oh my! I have a weakness for raw chocolate desserts. I’ll have to make these like NOW. Oh my freaking goodness those look SO GOOD =D Thanks for sharing the recipe! And yea… I want that kitchen. Man – so gorgeous & spacious! Oh my gosh, I am so excited to make these since I know for sure I have all the ingredients in my kitchen cupboards! Do you think it would be okay to go old school and mix by hand though? Our mixer is sadly broken. Yea I’m sure that is fine :) enjoy! I’m a long-time follower of your blog (for a few years now) and I just wanted to say how excited I am for the cookbook to come out. It looks like you’re hard at work on the best part of cookbooks–pictures!–and I can’t wait to see it in stores. This sounds amazing. I’m sure my family will love this. Do you think this would work with cashews or macadamias instead of walnuts? I’m allergic to walnuts and almonds. I’m wondering what type of nut butter would be best as a substitution and what type of chopped nuts? Thanks! Hey Kathy, I think hazelnuts would be killer in this, as would pecans or macadamias like you suggested. For the nut butter, I would think peanut butter would be great (if you can eat it, that is) as would sunflower seed butter. Hope this helps! Let me know what you end up trying if you make it. 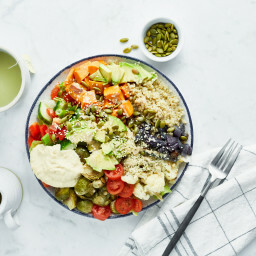 Hi Angela – this looks SO scrumptious and i’m bookmarking it to try it later this week. Just to clarify, you pour the mixture into a LOAF pan, not a square 8×8 or 9×9 pan? Thanks !! Hey Cathy, Yes a loaf pan is what I used although a square pan would be fine too, the fudge would just be much thinner. enjoy! 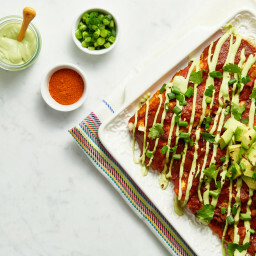 I’m going to make this tonight! Thank you! This was great! I omitted the walnuts, since I’m not a fan of whole nuts in food. But it turned out wonderfully. We had some company over and made this for dessert. After it’s frozen, should I refrigerate it to keep it over, or freeze it again? Haha, I have a chef kitchen you would probably drool over, but I am moving house! I am going to miss it so bad. 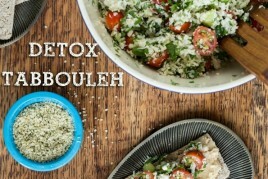 Love your blog, can’t wait for your cookbook! This recipe looks divine. Thanks for sharing! This fudge is by far the best I’ve ever had. I love the flavour combination of the chocolate, coconut oil, and nut butter. My boyfriend is also a huge fan, thank you for this recipe! 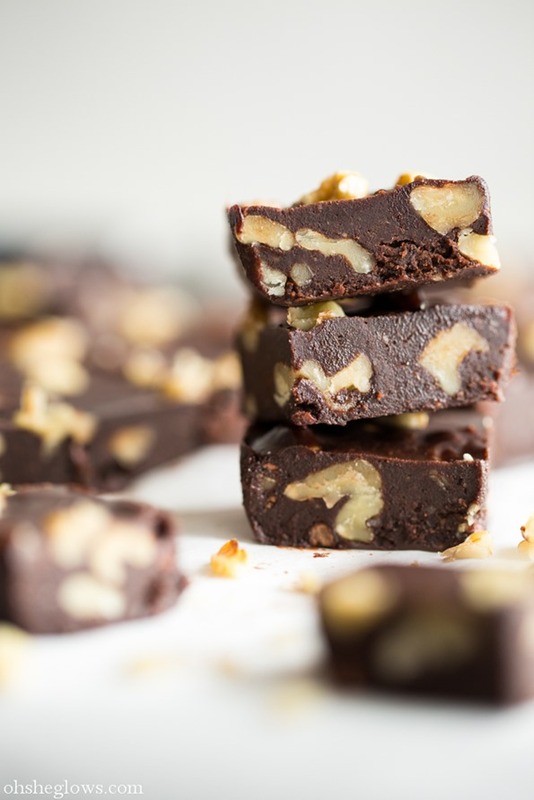 I’m so excited to try and make this fudge, after watching Forks over Knives, I have been switching my family and I to eating more plant based foods and we’re even going to do a plant based 8 week challenge which my mom is really skeptical about but I’m so excited of all the recipes “she said” I can teach her how to make!!! YAY!! But the reason I’m commenting is because I am 16, in high school and I have a few questions. I am starting XC this year at my school, because last year during a hard time in my life (depression, anxiety, social problems, etc.) I started running. I did about 4 miles every single weekend and I felt vibrant and happy so I thought I would try and join my cross country team. I was curious of what you would reccomend I eat pre race and post race? Most of the things like gels and jelly beans and bars and gatorade aren’t tasty to me and they are definitely not plant based and healthy. Also my team is having a potluck and since I’m a new member I thought I would make some food (also they won’t have anything vegan/plantbased) so I was wondering what you would reccomend to make that people might be intrigued to try! Thanks and even if you are too busy to answer I hope you keep on with the AWESOME posts on this blog!!! Thanks!! As for pre workout, generally unrefined carbs are best – it really depends on the person what works so you might have to experiment to find what your stomach can handle and how long you should eat before. I find a large banana and a tiny bit of almond butter is good before a light to moderate workout. Some people like toast and banana with nut butter. I generally save smoothies for post-workouts and I load them up with protein like hemp and chia seeds and occasionally plant-based protein powder too (such as Sunwarrior raw) for recovery. Hope this helps! Angela, this was gorgeous. I made this over the weekend for a picnic (mostly to impress somebody) and they were truly, absolutely amazing – slightly melted by the time we arrived (we travelled about an hour), but still great! Really, really impressed. I’m not yet vegan but successful experiments such as these are so inspiring! Please keep sharing. Hi Ashley, so glad it worked out for you! Thanks for letting me know. Wow… these look amazing. A girl can never have too much chocolate!!! Thanks for the delicious looking recipe! Do you think I could substitute tahini for the nut butter? I love how I almost always have the ingredients to your recipes in my kitchen already! This is definitely going on the list of things to make this weekend. What a gorgeous kitchen! I hope she makes good use of it. I always chuckle at beautiful kitchens whose owners don’t even like cooking, with jealousy. It makes me so excited for your cookbook, too! Thanks for sharing the details and process with us. OMGOODNESS! As soon as i read this recipe I ran straight into the kitchen to make it. All I have to say is wow! I did everything the recipe called for and I just popped them in the freezer so i haven’t tried the finished product yet but the batter taste fantastic! Thank you so much for another wonderful recipe Angela! This is awesome. If can get hold of walnuts straight from the tree, they are amazing. Nothing like what’s been on the shelves for a while I love this recipe :) Great post. Wow..great recipe.Glad that I found your blog.And pictures are amazing by the way. Speaking of creativity – have you ever heard of and/or used Besan? It is ground up chickpeas. Middle Eastern folk use it as a flour. I buy it very cheap at the Middle East market in my town and I use it for my pizza crusts. This creates a very nice, thin, crisp crust and I love eating it because of the flavor and nutritional value. 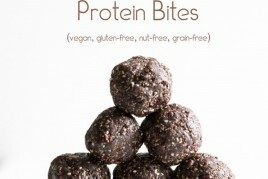 These would be perfect for my vegan dinner party guests! Thanks for the idea! Sounds like a fun photoshoot and wow, that’s indeed a dreamboat of a kitchen. 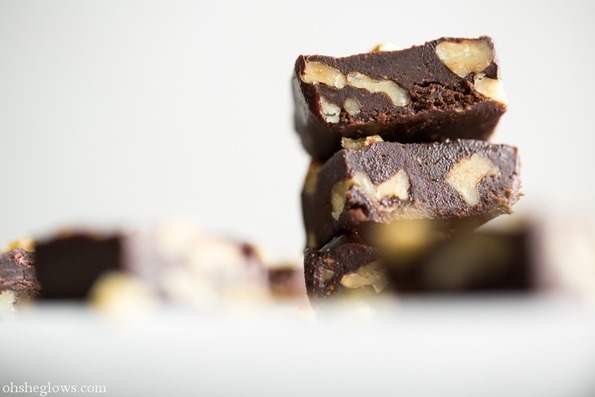 This fudge recipe is really seductive that I couldn’t resist making them. It’s so good. Just wanted to tell you I adore your blog! As someone who is newly experimenting with veganism I was incredibly intimidated my some vegan sites I found online. With lots of exotic and complicated instructions and ingredients I was ready to throw in the towel. I found your blog and you make it so simple!! I am ready to give it my all now!! :) thank you Angela. Hey Katie, Thank you – I’m so happy to hear that! This is really lovely kitchen. I love it. Great design. The fudge looks perfect – I found some coconut oil in Chinese shop for cheap as it is really expensive in Europe. If Chinese shop dont have it in stock – just ask for it. They sometimes have more specific food stored in the back of the shop. Made this last night with a mixture of walnuts and raw pecans. It is perfection! I stumbled across your website today and found this recipe. I decided to make it when I got home since I already had all the ingredients. It was super easy to make (10-15 minutes), and it only took about 25 minutes to set. This fudge is DELICIOUS!!!!! I’ve never tried making any type of fudge before, but it came out perfect! Even my husband (he’s an omnivore) loves them! Thanks for the recipe, I will undoubtedly make this again in the future!! Hi Angela, I would love to try this recipe but I’m battling candida at the moment. Can I sub the maple syrup with stevia? Can I have your kitchen, please?! The recipe looks delicious I’d just have to leave out the walnuts (allergies)! hah sadly that’s not my kitchen – just used my landlord’s for the day. Angela that kitchen is gorge! And this fudge looks absolutely divine. I can’t wait to try it. I love dense, deep chocolately, rich, sinful desserts like this so this fudge looks like a real winner! My Mom makes Barefoot Contessa’s chocolate walnut brownies on special occasions but they are sadly not vegan and they are very, very unhealthy. This fudge will be a welcome replacement ;) Thanks! First off, that kitchen IS dreamy! Your landlord is extremely lucky; plus the lighting is beautiful. Made these today. They will be a staple I am sure of it. I’m glad I took a chance in this recipe. I almost toasted the walnuts but I’m sure glad I didn’t do that.. They were perfect. Hard to stop at one though!!! Hey Cindy, Im so happy they were a hit! Yes it’s very hard to stop at one (or two…) enjoy! Fantastic! Really delicious and not at all guilt inducing. It’s so rich I can only eat a little bit so it’s lasting me a good long time in the freezer. Oh my. This looks divine. I need to whip-up a batch. And soon! I was just curious as to whether these need to be stored in the freezer? I’m sure they will be eaten quickly anyway but if there are leftovers should they remain refrigerated or frozen? Either fridge or freezer is fine :) enjoy! Oh my gosh Angela, I made this and I am totally obsessing. This is THE best fudge that I’ve ever had and it’s SO easy to make. It literally took less than 5 minutes and it was so delicious. The fudge game out dense and “sink-your-teeth-in” and it was majorly chocolatey. I’m in love and I will definitely be making it again! I have made this fudge multiple times now. I omit vanilla and use raw pecans instead of walnuts. It turns out delicious every time! I started bringing it to Potlucks and everyone just goes crazy for it! It is so easy and quick to make, yet has that decadent flavor and similar consistency to traditional fudge. Thank you for this amazing recipe! I am in love and so are all my friends with this fudge. I applaud you for this recipe….it is truly amazing! My hubby even said it was delicious and he is a meat and potatoes man (but slowly moving more plant based)! I’m so excited to take this to get togethers and be able to tell people is is vegan after they rave about it. Thank you Angela for all your inspirational work and delicious recipes! Im about to make this for the third time. AMAZING. I have now added dried cherries to the recipe as a MUST though….I cant even express how amazing they are in this! Great idea. Thank you for the tip. This is the most phenomenal fudge. Never will I go back to regular fudge again! I used 1/2 natural pb and 1/2 almond… wow. Aside from giving it to your friends on ice in a cooler, I am not sure! hah. Can I substitute date syrup for the maple syrup. Love love your recipes, I have made several. Hi Suzanne, I haven’t really done any baking with date syrup so I’m not sure. But I would think it should work with any liquid sweetener? What can I substitute for virgin coconut oil? I don’t want to have that in my fudge, thanks. I wanted to know what brand of cocoa powder do you use? I have the Hershey’s unsweetened. I also wanted to know what food processor you use in your recipes. Hey Alexandra, Thanks for your lovely comment! I use a Cuisinart 14 cup processor, but you totally dont need one that large. I think a 9 cup would probably do just fine! They have dif. sizes. I use various brands of unsweetened cocoa powder…depends on which grocery store I happen to be in. I probably use the Cuisine Camino brand the most though. Hope this helps! Mine turned out pretty flat like a pancake, is this normal?. Also I had a very hard time mixing it, was very thick…did I do something wrong with it as I followed the directions. It does taste great though. Perhaps next time I will roll them up in balls and then roll them in shredded coconut to make tiny truffles. They just taste and seem more like chocolates but I do love them! What a wonderful, delicious recipe~ after making the first batch, I’ve just made a second batch to take to an ugly sweater party for tomorrow. It is so easy, and so amazing. THANK YOU! Can these be frozen and saved for a couple of weeks? I can’t see why not! Just wrap it up well. You mentioned cutting the recipe in half. I would like to double it and was wondering if an 8X8 square pan would be suitable. Thank you for all your fantastic recipes. You’ve outdone yourself this past week. Your Turtle Cookies and Fudge will be a part of our Christmas menu! I just made these today and they are Off The Charts!!!! Angela, hi! Is it 1/2 cup solid or melted coconut oil, same question with the raw almond butter… is it 1/4 cup liquid almond butter or 1/4 solid almond butter? Hi Sandy, You measure the coconut oil when solid (or semi-firm) – you can see it in one of the photos there. As for the almond butter, you can use any kind you prefer. Hope this helps! Hands down, this is the BEST fudge I have ever tasted. I am falling in love with your recipes and can’t wait to pick up your new cook book this spring. My sincerest thanks. Hi Angela – this looks wonderful! I am trying to avoid oils. Could I leave out the oil in this recipe, or substitute something else? Thanks! I made this to mail to my valentine and I ate some and they were TO DIE FOR! I don’t know how they’ll ship though hahaha. Good thing it’s reallllly cold everywhere! I made this yesterday with the agave/cacao and without the salt/vanilla and tasted amazing! Hi there :) I’ve just made this for a friend tonight. I’m sure she will enjoy it! I’m just wondering how long it will last out of the freezer. Or can I store it in a box when it’s ready? Thank you for your recipes. I do love them! Hey Pali, I would store it in the freezer of fridge and not let it sit out long at all. I’m sure positive how long it will last but I would expect up to a month? Thanks, Angela. They are delicious! Amazing velvety smooth and tasty fudge. I didn’t have any nut butter on hand so I made it with tahini. Holds together well but it’s messy (melts) on the fingers, possibly due to the tahini being too liquidy. These are amazing ! the taste is so subtle and … seductive, the title is just right ! We had them for dessert after your basil and cashew pesto lasagna (again!) and I must say I am really thankful for all the recipes you post, they’re so delicious and packed with flavor and healthy (when eaten in moderation!) as to make you want to eat little extras between meals, just because they’re so tasty. For example, eating your lasagna at 4pm is perfectly ok for me :) Thanks Angela ! Amazing recipe! I just made some and its in the freezer hardening up :) I was just wondering if its best stored in the freezer or fridge? Either way is fine…depends on what kind of texture you prefer. Freezer will make them a bit firmer. enjoy! Oh my gosh, I just made these with a sprinkle of unsweetened coconut flakes on top and they were divine! So decadent (never though I’d say that about vegan food before trying your recipes hah), thanks Angela!! These are the bomb, no joke! The walnuts were a great addition. This is actually almost identical to the raw fudge recipe that I ‘adapted/created’ myself after eating one of Hail Merry’s Miracle Tarts and attempting to copy the recipe from the ingredient list on the package! So addicting! Do you measure coconut oil when it’s room temperature or do you melt it and then measure? I’m going to visit my grandchildren and they know me as the “I don’t have to see what grandma is putting in my mouth because I know it’s going to be delicious”, grandma……phew that was a mouthful. Can’t wait to try this recipe. Everything else I have made from Nom Nom Paleo has been so tasty so I know this will be as well! Agave is anything but raw. It is very highly processed. Oh my…I just made these yesterday morning and they are quite simply DIVINE. I used cashew butter and Texas pecans because that is what I had on hand – sooooo good! I would like to serve these at a party. Do you thing they will hold for the whole party? Just made this fudge. I was expecting it to turn out oily, but it was fantastic!! So fudgy and rich! I just tried my first batch. A truly wonderful, and seductive, candy. I didn’t have maple syrup hand so I used honey and the came out great. Thanks for the excellent recipe. Is it even normal to like a recipe this much? Just took a small piece out of the fridge… 2 minutes later another one.. Have to force myself not to run back like a crazy person to eat everything.. My o my! Seductive? True that! I made this fudge for a party on the weekend and it was absolutely delicious! I didn’t realize though that they need to be kept in the freezer or fridge – they sat out too long on the dessert tray while dinner was being served and turned into mush. It was okay though – the guests were forgiving and started licking their fingers and eating it with spoons! YUM! This is an beautifully decadent tasting treat. Thanks Angela! I have your book too. 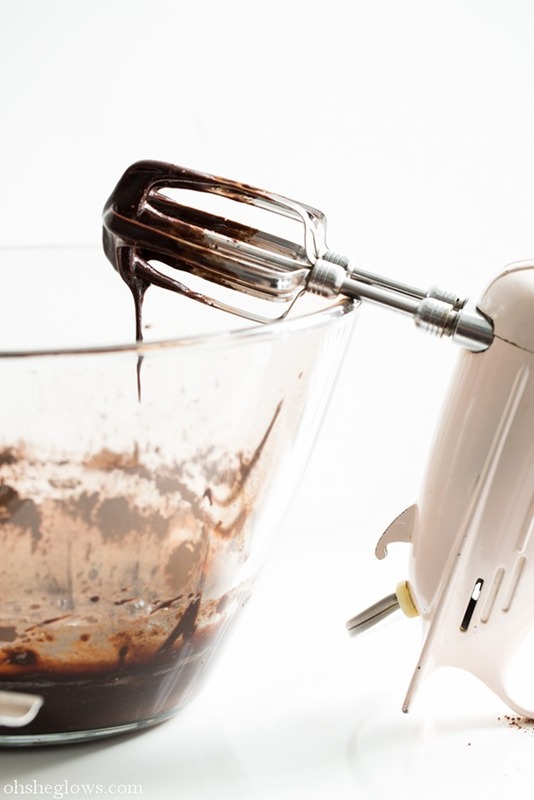 Can all of your cookie recipes be easily doubled without any problem? I made these today and they where soooo good!!! Thank you so much for this recipe!!! I just made these last night and I have one question: Do you keep them in the freezer until you serve them or do you transfer to fridge after they are solid? I want to serve them in a few days so. And if (i hardly doubt it) if there are any pieces left do I just freeze them again? I usually leave them in the freezer until serving :) But the fridge might be fine too. Enjoy! I would like to make this minus the chocolate nibs and cocoa powder, but would like to add bananas how many bananas would i need? No beaters here, would this work in a vitamix? I am wondering the same thing. Can I use a food processor or vitamix. Have you tried yet? I haven’t tried a food processor or blender, but I can’t see why both wouldn’t work? I’d just be cautious not to overmix it. Please let me know if you try anything out! OMG. This is the best fudge ever. The taste profile is perfection. It’s super creamy and chocolaty with nutty, vanilla hints (i used peanut butter instead of almond butter). And it’s so easy to make, it’s crazy! Thanks so much for this awesome recipe! May I substitute coconut oil with any vegetable oil? No, you have to use coconut oil because it hardens when it gets cold. The coconut oil is what makes this fudge harden and hold together. I keep a batch of these in my freezer @ all times! Angela, I could swear I made this previously without the nut butter and that I saw the idea for a nut butter-free fudge on your website. Am I going crazy? 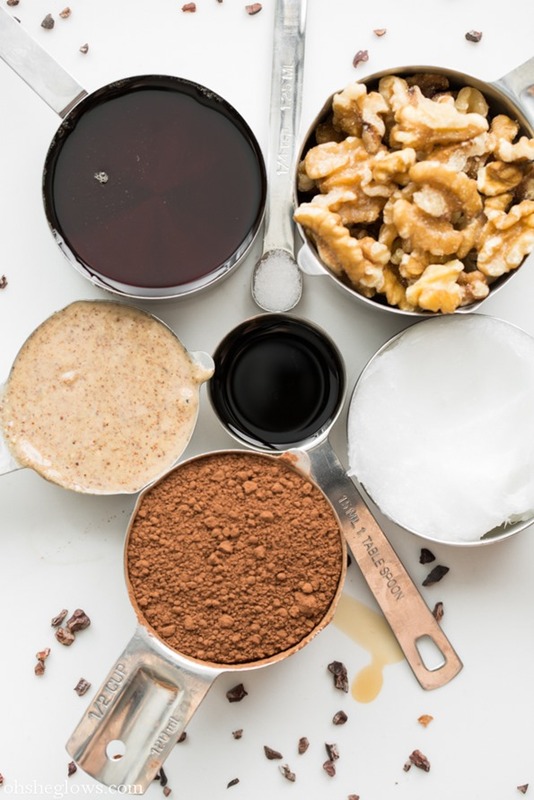 Is it possible to make this without the nut butter? Hi i was hoping to replace aprox half of the liquid sweetener and coconut oil for dates how would u recommend i do that? I wanted to tell you that this recipe is delicious. I made a batch and couldn’t be happier with the results. I posted about it on my blog with a link back to you and your fabulous recipe. Hi, I made this and the chocolate and oil separated before I even got to add the walnuts. Any ideas as to why? I’m wondering if it’s due to the hot climate here in Australia? It’s not overly hot inside but the coconut oil is melted (not white like it is in your pic). Otherwise I don’t understand why it’s not working, as I’ve made it once before and it worked fine …? I have always used solid coconut oil and it is perfect every time. If yours is liquified put it in the fridge until it is solid and try again. It is well worth the effort. My niece made this for me as a Christmas treat this past year and, well, let’s just say my taste buds rejoiced. Such a gorgeously rich chocolate fudge. p.s. I just made myself a batch and cannot wait until it’s out of the freezer. I absolutely love this recipe ! I make it all the time . I would love to make it for my yoga studios gathering next week but I’m afraid that in the Kansas summer heat it will get all melty even indoors . Any suggestions for how I can alter the recipe to make it stand up a little more at room temperature ? I thought of adding dates into it but I’m just not sure how that would work . Or maybe if there’s another similar recipe you know of that would be a little more solid at warm room temperature ? I love your recipes and I have your cookbook and have made many of the dishes from it . A little more work and my husband might be open to being a vegan LOL ! Best silkiest fudge ever! Thank you! OMG. These are so simple to make and yummy! I want to eat the whole pan! This is one of my favourite staple recipes. I have made it many times. I make it without the nuts or with slivered almonds. I have also put in mini marshmallows which the kids love. I am wondering if I can use a food processor rather than a mixer as my mixer is up north. Thanks again for your wonderful recipes. Me and my family enjoy them immensely. Hey Jennifer, I’m so happy you love this recipe! I haven’t tried a food processor or blender, but I can’t see why both wouldn’t work? I’d just be cautious not to overmix it. Please let me know if you try anything out! This recipe is incredible. Thank you so much – Sincerely, a vegan chocolate lover. I’m so happy you loved it Halle! It goes fast in our house :) Melt in your mouth…am I right? Thanks so much Angela for another delicious recipe! Since I am going to be serving this to adults and children in the evening after dinner I used 75% roasted carob powder and 25% cocoa powder and adjusted the sweetness accordingly (didn’t want anyone to have a hard time going to bed on time.) I am very pleased with the fudge and I can’t wait to serve it to my friends tomorrow. Thanks again!